Andalucia, the region that covers most of southern Spain, much of it having a hot dry climate, is different to much of the rest of Spain, partly due the influence of the Moors who controlled the area for several hundred years. Huelva, the most westerly province of Andalucia includes the nature reserve, Coto Donana National Park, the largest roadless area in western Europe, important to many migratory birds along with the Iberian Lynx. Columbus planned his expeditions and set sail from the ports around the city of Huelva. South East of Huelva, the Atlantic coast (Costa de la Luz) has fine beaches with long stretches of white sand but with very little development, only small resorts noted for their seafood. The most southerly province of Andalucia, Cadiz includes the south eastern end of the Costa de la Luz with its long white sandy beaches, down to Tarifa at the sothern tip, a major wind surfing area. The province includes the town of Jerez, the home of sherry making, along with the area of vineyards in the western corner of the province. The city of Cadiz is believed to be the oldest city in western Europethat is still standing, having been founded by the Phoenicians, and was important in Roman times. Cadiz is home to the Los Acornocales Nature Park (one of the worlds largest cork oak forests) and the Sierra de Grazalema Nature Park (with its rare Spanish Pine forest and colonies of birds of prey). Cadiz city has a fast train service connecting it to Jerez, Seville, Cordoba and Madrid. One of the most important privinces in Andalucia for tourism, Malaga has something for everyone, superb sandy beaches, nightlife, dramatic hills with pueblo blancos (white villages)such as Ronda, Mijas and Frigliana, glamorous resorts like Marbella together with the more Spanish resorts of Estepona and Nerja. Amongst the hills you will also find lakes including Lake Vinuela. We have self catering holiday rentals in Malaga in or near the following towns. The province of Granada is possibly one of the most diverse and interesting in Andalucia, being the last Moorish stronghold, their evidence is in abundance. The city of Granada is home to the Alhambra, the famous Moorish palace and to the south east are the Sierra Nevada, the highest mountains of mainland Spain, rising to 3,481m at the peak of Mulhacen and home to its ski resort of Sol Y Nieve. On the Mediterranean coast, the Costa Tropical, there are the resorts of Almunecar, Solobrena and Motril, with fine sandy beaches and a strong Moorish influence. Between the Costa and the Sierra Nevada, on the southern slopes of the mountains are the wooded valleys of the Alpujarras with the many paths favoured by walkers. This area also shows the signs of the Moorish influence and, together with the Sierra Nevada, constitute a large National Park which is home to at least 66 species of plants that are native to the area. Inland are Montefrio with its Arab fortress, Alhama de Granada with it's spa and Arab fortress and Guadix one of the oldest settlements in Spain with it's cave dwellings carved into the rock. 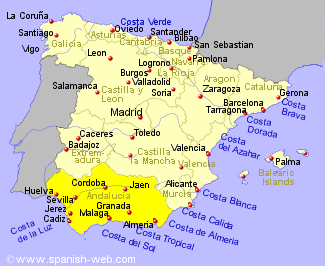 We have self catering holiday rentals in Granada in or near the following towns. With the driest climate in Spain, part of inland Almeria provided the scenery for a number of westerns in the past, the film sets now providing tourist attractions for the Spanish and others. On the coast, there are 2 main tourist resorts, Roquetas de Mar with medium high rise developments on a flat peninsula just west of Almeria city, and Mojacar to the north, a low rise resort spread along the coastline with a facinating Moorish Pueblo Blanco a couple of Km inland. Just north of Mojacar is the important naturist resort of Vera Playa. Between the two resort areas lies the Cabo de Gata Natural Park where the mountains fall sharply to the sea with hidden coves of white sand. We have self catering holiday rentals in Almeria in or near the following towns. The beautiful city of Sevilla is the capital of Andalucia but the province does not see too many visitors away from the city. Sevilla has no coast line but has a wealth of magnificent monuments. Sevilla city has a very good High Speed Rail Service connecting it to Cordoba and Madrid. A province with a rolling agricultural landscape including olive groves and vineyards but few visitors to this part of Andalucia. 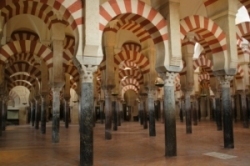 The city of Córdoba which was the Moors capital atone time, is famous for the huge mosque or Mezquita, and the houses with highly colourful patios that are open tothe public for the festival in May. Cordoba city has a very good High Speed train service connecting it to Sevilla and Madrid. Jaen has mountainous regions where two of Spains most important rivers begin, the Guadalquivir and the Segura, and vast areas of olive groves, mostly unvisited by tourists which gives this part of Andalucia a special charm. You will also find whitewashed villages and towns with impressive Renaissance buildings.